Outdoor temperatures fluctuate with the changing seasons but underground temperatures don't. Four to six feet below the earth's surface, temperatures remain relatively constant year-round. A geothermal heating and cooling system, which typically consists of an indoor unit and a buried earth loop, capitalizes on these constant temperatures to provide "free" energy. In winter, fluid circulating through the system's earth loop absorbs stored heat and carries it indoors. The indoor unit compresses the heat to a higher temperature and distributes it throughout the building. In summer, the system reverses, pulling heat from the building, carrying it through the earth loop and depositing it in the cooler earth. How efficient is a geothermal heating and cooling system? 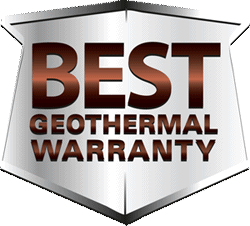 A geothermal HVAC system is three to four times more efficient than the most efficient ordinary system. Because geothermal heat pumps do not burn fossil fuels to make heat, they provide three to four units of energy for every one unit used to power the system. An air-source heat pump, for example, extracts heat from outdoor air and pumps it indoors. Geothermal heat pumps work the same way, except that their heat source is the warmth of the earth. The process of elevating low-temperature heat to over 100° F and transferring it indoors involves a cycle of evaporation, compression, condensation and expansion. A refrigerant is used as the heat-transfer medium which circulates within the heat pump. The cycle starts as the cold liquid refrigerant passes through a heat exchanger (evaporator) and absorbs heat from the low-temperature source (fluid from the ground loop). The refrigerant evaporates as heat is absorbed. One thing that makes ground source heat pumps so versatile is their ability to be a heating and cooling system in one. With a simple flick of a switch on your indoor thermostat, you can change from one mode to another. In the cooling mode, a geothermal heat pump takes heat from indoors and transfers it to the cooler earth through either groundwater or an underground earth loop system. In the heating mode, the process is reversed. Can ground source heat pumps also heat water? How long is the payback period for a geothermal heating and cooling system? As an example: If you'll save $700 per year with a geothermal heating and cooling system and the price difference is $2,000, your payback will be less than three years. If you install a geothermal system in a new home, the monthly savings in operating costs generally will offset the additional monthly cost in the mortgage, resulting in an immediate positive cash flow. Smith Sustainable Design is among the leaders in the installation of geothermal heat pumps in New Jersey and Pennsylvania. Our team has years of experience in geothermal heating and cooling design and installation, and electrical and structural engineering. All our projects are engineered in-house, offering flexibility and control. Most of all, we ensure that all project financing and energy credit revenues are maximized. You can count on us to help put your hard-earned money back in your pocket through our affordable energy solutions.